As you’ve probably noticed by now, the App Store ecosystem is loaded with ways to get free games. Whether you’re involved in some elaborate referral code scheme or are simply downloading a game that a developer paid (potentially lots) of money to be promoted as free, quality is something that is rarely considered. We aim to change all that. 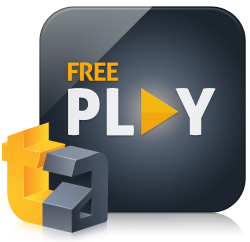 Today, we’re rolling out a new program we’re calling TouchArcade Free Play. We’re following a few guidelines for this project, which will all likely evolve over time. First off, and arguably most importantly, we’re only going to be featuring games that were well reviewed by TouchArcade, and we aren’t receiving any payment for featuring them. The selection process is purely based on our editorial staff and the generous cooperation of the developers. We are also going try to find quality games that have never been free before. This isn’t a promotion that’s going to be scheduled on a daily or weekly basis- It’s meant to be something special, something to get excited over, and something to look forward to. Additionally, they are all going to be real games, as they were originally meant to be played- Not games that are promoted as free as part of a stealth update implementing loads of IAP and in essence turning it into a free to play game in the process. Essentially, when a new TouchArcade Free Play game goes up, it’s our way of saying, “This game is great, everyone with an iOS device should have it, and now you can for a limited time without paying a cent." All you need to do is keep an eye on TouchArcade for new Free Play titles, then download and enjoy them. If you like the games, help out the developer by leaving an iTunes review, telling a friend, participating in the forum thread and/or checking out the rest of their iTunes game library. That’s it. There’s no catch. Stay tuned for the weeks and months ahead for all sorts of awesome free games courtesy of TouchArcade. Our first Free Play title is Aralon: Sword and Shadow HD ($4.99), read more about this incredible open world RPG here. To stay on top of future TouchArcade Free Play titles, bookmark http://toucharcade.com/freeplay and download the TouchArcade app (Free) to get push notifications of when they go live!